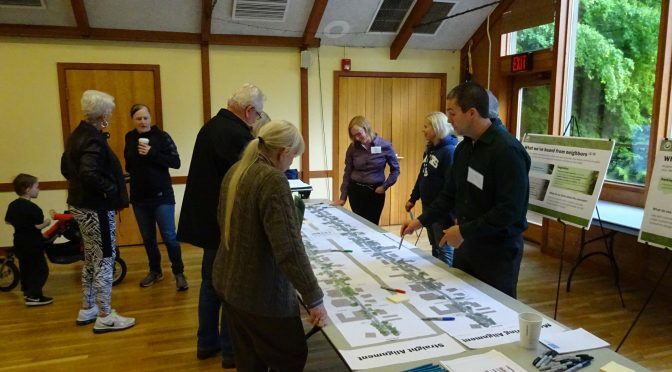 After hearing from neighbors last winter and throughout the summer, the City and consultant team have moved forward on design details for D Avenue stormwater, pedestrian and pavement improvements. Please join us at an open house on October 26 to see our progress, ask questions, and comment on design details and construction staging. D Avenue is being designed with a gentle meander (slight curves) between State Street and 10th Street. The meandering alignment allows the designers to strategically locate stormwater management areas, preserve mature vegetation where possible, and provide traffic calming. The design team is working to balance the need for improvements while retaining the character of your neighborhood street. Design work will continue through 2017, with construction anticipated to start in spring 2018. All materials presented at the open house, along with a summary, will be available on the materials page shortly after the event. We look forward to seeing you on October 26! For more information, please contact the project team.